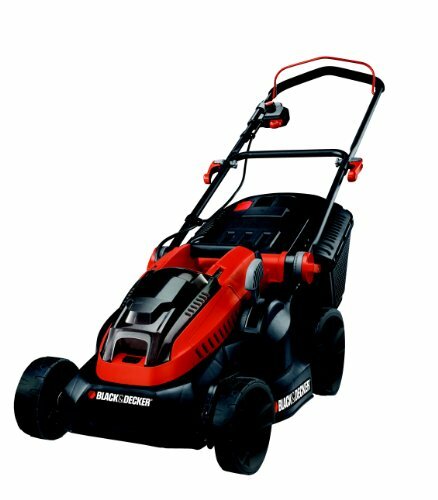 Black and Decker’s offering in the world of battery powered mowers is like others in its class, an expensive solution but one that could well be worth the investment if you’re not enamoured by having a) a lead trailing behind you as with a conventional electric mower, or b) the mess and noise of a petrol mower. Granted there isn’t much of a cost difference between a battery mower and the latter, but they do have other distinct advantages. 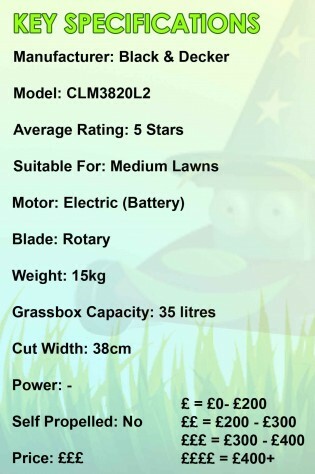 With the CLM3820L2-GB the first thing to note is that 2 batteries are supplied, so you can have one on charge whilst you use the other, and should you still require more mowing time during a single session you’ll always have another one ready and waiting. None the less, this mower is designed for lawns of up to 600 square metres so you should keep that in mind before you go ahead and buy it, there is little point over stretching what this is capable of for the sake of it. 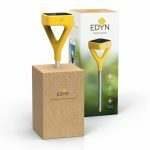 If you have concerns about the reliability of the batteries then it’s worth taking the time to consider the implications of modern lithium ion battery technology, it’s far more efficient than conventional NiCD / NIMH battery technology, and what’s more the batteries supplied with this mower are specially designed to be resistant to moisture ingress, vibration and accidental self discharge. Even better still, this type of battery is inherently lighter than traditional equivalents, and thus at 15 kg overall this mower is perhaps only 2 or 3 kg heavier than an equivalent corded mower. Modern battery technology really has come on leaps and bounds in recent years, and it lends itself perfectly to lawn mowers. The CLM3820L2 features all that technology integrated with Black and Decker’s expertise in creating user friendly, easy to use products that do the job well. Obviously if you can cope with having a cable trailing behind you, or simply don’t require the level of freedom that this mower provides then it’s over kill, but if you do want the added versatility and you can justify the additional outlay you’ll reap the benefits in the long run.